When it comes to our favorite senior citizens, we need to take very good care of them, as they have done the same when we were little. With the guidance of this article, you will be able to find out what the best non-slip slippers for elderly citizens are, especially if you do not have enough time to do all the research. After carefully analyzing the value and quality provided by some of the acclaimed products, our team has concluded that the Spenco Men’s Supreme is the first option you should consider. They are made from leather and faux fur, featuring deep heel cupping for support, and they also come with a metatarsal dome design to alleviate forefoot pressure. In the unfortunate event you cannot find Spenco’s slippers for sale, you might consider Haflinger Women’s SC Saskatchewan as the second best option. 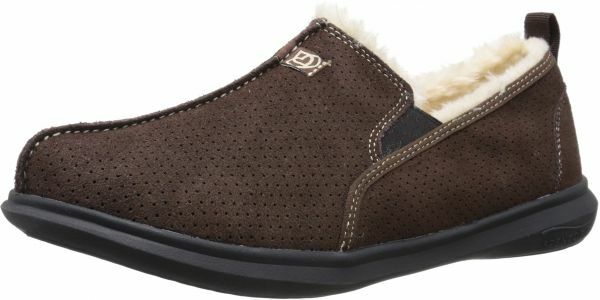 Ideal for people who need orthopedic footwear, made from leather and faux fur, and featuring a synthetic sole, these slippers promise to deliver superior support, comfort, and stability. Moreover, they come with an ultra-fresh antimicrobial treatment to help you control odor. Enhanced comfort is also ensured by the contoured support footbed and the lightweight EVA outsole. The metatarsal dome and the orthodontic grade arch support ease forefoot pressure. Several buyers say the slippers fell apart after only a few uses, otherwise they are very comfy. If boosted comfort is what you have in mind, then these slippers deserve a try. Upgrade your walks to enhanced coziness and stability if you go for these stylishly-designed slippers. The plush shearling fleece used for their interior is bound to help you bask in comfort whereas the cork midsole will eliminate shock. A good grip and excellent stability are ensured by the rubber sole. What’s more, thanks to the latex molded arch, you will also enjoy stability. Due to the waterproof, textured sole, traction is another benefit you can add to the above-mentioned list. A few buyers say that the slippers run small and proved to be too tight. Check the size chart carefully. Stylish, comfortable, and stable, these slippers should not go unchecked before buying. Made of high-density memory foam, these stylish slippers promise to pamper your senses and help you bask in comfort whenever you wear them. Durability is ensured by the strong and firm sole whereas the risk of accidents is minimized by an anti-skid textured bottom. Furthermore, due to the breathable design, your feet will stay fresh and odorless. You can thus wear them even without socks. The slippers are machine washable, so keeping them clean won’t be a difficult task. At least one customer says the slippers lose their shape quickly while other buyers say they run big. Give these slippers a try if you want to enhance your comfort while reducing the risk of slipping. As we grow older, our legs, ankles, knees, joints, and body require more support. In less fortunate situations, you might be looking for crutches or even a lightweight wheelchair, but in our case, we mean the right kind of shoes for seniors. We have picked a few of the top-rated products available today. If you are looking for a great granddad gift, you might be interested in this model. The Spenco slippers are made from leather and faux fur, with a synthetic sole. The slippers are designed with a deep heel cup for support. In order to ease forefoot pressure, they come with a metatarsal dome and an orthodontic grade arch support. Spenco’s slippers feature a non-slip and non-marking outsole. To help control odor, they come with an ultra-fresh antimicrobial treatment. The lightweight EVA outsole and complete contoured support footbed provide a high level of comfort. Customers who purchased these slippers usually describe them as being very comfortable and perfect for people who need to wear orthopedic footwear. Apparently, they are beneficial for seniors suffering from plantar fasciitis. One of the customers even mentioned that her husband practically lives in them, that is how much he likes them. With these slippers, you can have a rustic look, offered by Haflinger. They are very soft and come with a center seam detail and a cross-stitch feature. The interior is made of plush shearling fleece offering coziness, and the cork midsole eliminates shock, making them comfortable to wear. The genuine rubber outsole helps in maintaining grip and stability. 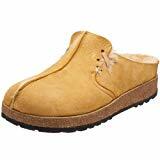 Haflinger’s slippers are imported, made in Germany. The exterior is made from genuine leather, and the upper features a patterned metal hardware, which offers a chic and stylish look. You get your feet massaged with every step with the help of the latex molded arch support. With a waterproof, textured outsole, you get support and traction for your feet. Based on product reviews, this item has a fair value for money, so if you are looking for grandma gifts, you can consider this option. RockDove comes a pair of microfiber women’s house slippers. They are made of high-density memory foam, which cushions your feet and rebounds with each step you take, helping you become comfortable and relaxed after a long day of standing or walking. The sole is strong and firm, making the slippers durable, but it is also soft enough to allow you to step noiselessly. This item features an anti-skid textured bottom, which helps prevent slipping on a wet floor. A great advantage is that the slippers are very easy to clean, as they are washable in the machine. The scaled upper part is designed in such a way that it will not collect dust or hair as other types of house shoes do. The breathable design with open back ensures your feet are kept fresh and odorless, whether you are wearing socks or not. The Bigcount slippers are ultra-lightweight, made from EVA with a synthetic sole. They weigh 120-130g, which makes them super comfortable. These shoes feature a breathable upper part, for good permeability, and they are anti-slip, which offer safety when worn. A high-quality material ensures the slippers remain odorless. The most significant advantage is that these shoes can be worn anywhere, for a number of activities. You can wear them in the house, but you can also use them out when going to the beach, gym, pool, shopping, or take your dog for a walk. Given their design, these are not just house slippers, and if you wear them outside, you will look and feel great, especially if you have to walk or stand for a longer period. Your feet will most probably thank you. Also, they are not suitable just for your grandma; you can get a pair too. If you are in search for the perfect gifts for grandparents, you might want to take a look at Matari’s slippers. They come in a wide range of colors and sizes and are also suitable for both men and women. And if you are there, you can take a pair for yourself, as well. The design makes them proper for various ages. The slippers are made from PVC and the sole from PE. There are multiple colors available for this item, such as watermelon red, blue, gray, purple, green, or pink. They are made from high-quality materials, with an anti-slip design. Matari slippers can’t be used as home shoes, but they are excellent for showering, swimming, going to the beach, or other casual activities, as they are comfortable to wear, and also to wash.
BODON’s shoes come with massage particles inside for a softer, non-slip, more comfortable wear. Your feet will not feel tired thanks to the bow-shaped sole design. The anti-slip texture of the sole improves the friction of the ground, making walking effortless. These shoes are not meant for house wear only, as you can use them to walk your dog or to go into the garden, or even to your swim class. They are ultra-lightweight (100-120g per piece), which makes them even more comfortable to wear or carry them in your bag if required. Also, it is relevant to mention that the high-quality material maintains the shoes odorless. The design is multi-age suitable, so you can get a pair for your parents, grandparents, and even for yourself. They come in multiple colors and sizes. The Happy Lily slippers are made from high-quality closed-cell EVA foam. They are comfortable, stylish, breathable and quite flexible. The sole is thicker than other types, which makes wearing them a comfortable experience. They are also anti-skidding, wear-resistant, and very flexible, made from an environmentally friendly material. You can wear these lightweight and silent slippers in your home, but also at the spa, gym, swimming pool, beach, or for other leisure activities. The slippers are suitable for men and women of any age. They come in various sizes and colors, so your entire family can enjoy them. According to customer reviews, these slippers are indeed very comfortable, ideal for a multitude of activities, and they manage to stay odorless, which is also a significant advantage. The value for the money is a fair one. These lightweight flip-flops are molded with high-density EVA and are grippy for multi-directional traction control. The footbed is designed to be very soft, with excellent flexibility and high elasticity, and the arch support is contoured to offer comfort and to protect your foot joints and ankle, by minimizing walking stress. No matter where you have to walk, your feet will get the necessary support ensured by the soft-touch strap and the shock-absorbing function. The manufacturer designed these eco-friendly beach flip-flops to suit all types of people, from elders to expectant mothers, or for the ones who want comfortable slippers. They come in purple, brown and black colors. It is essential to mention that these slippers are not only comfortable and stylish, but they are also very safe, as they come with an anti-slip feature. Finding the best slippers for elderly citizens can take a lot of time, because there are way too many models available on the market, made from specific materials, with various designs, and going through all of them is very hard. However, if you want to get good non-slip slippers for seniors, you will need to make a decision, and for that, you need to do your homework. We know that time is extremely valuable, so we decided to help you out. We have gone through reviews of non-slip slippers for elderly, surveys, and other resources, in order to gather all the necessary information. If you are looking for cheap, expensive, house, or outdoor slippers, our guide is the perfect place to start. This may seem strange, but it is essential to prevent a senior person from falling. The truth is that from a certain age, a severe fall can become life-threatening. That is why it is crucial to get the best senior non-slip slippers. Proper house shoes are necessary for elderly persons, even more for people who live alone. Slippers offer comfort and support and keep them safe from slips or falls. Seniors prefer things to be simple. This type of shoes are very easy to put on and take off, and they provide more comfort than athletic shoes or dress shoes, and they are generally easier to handle on a day to day basis. If you want to find a comfortable pair of slippers, you should consider soft, cushioning materials like memory foam, or cotton with soft linings. This is especially significant for the insole, where the foot maintains direct contact with the shoe. One of the most important aspects is the non-slip bottom. The sole should be made of rubber with a pattern to offer extra grip. This feature is not essential just for safety and security, but also for comfort and increased support for the ankle, heel, and knees. The non-slip sole is one of the most critical considerations in the safety of shoes for a senior. If it is very soft, it does not provide any support to the foot, and it could slip easily. Outsoles that are too firm may cause an older adult to stumble from the lack of flexibility. Also, soles which are too thick can destabilize the ankle. The market is full of slippers with different styles, another essential detail when it comes to searching for a pair fit for your senior. For instance, some slippers wrap around the front part of the foot, with no coverage for the heel. Other types wrap around the foot, similarly to ballerina shoes. Others look like regular footwear with firm rubber outsoles and support up to the ankle. In order to keep things safe for an elderly person, you can go for a model that supports both the front and the back of the foot. If the open heel type is not tight enough, it might slip off easily. Still, the shoe must not go all the way to the ankle, not to restrict its movements. A very old person should stay away from the slip-on style and choose one that has support around the ankle, but that still has a wide opening at the mouth to make it easy to put them on. This will make them feel much safer and also comfortable. It is true that you should not care how much a product costs when it comes to your beloved senior, but you should also make sure that you are not paying more for anything which values less. When you find a number of products to choose from, you should go through the customer reviews. Manufacturers will provide many details about their products, but they will offer only the advantages. There are many situations in which you end up buying a product according to certain specifications, only to find out that things are not quite as advertised. By reading owner reviews, you can find out if a specific item is worth the money. And if you find a pair of slippers you think are too cheap, you can get something else as well to complete the present. We suggest looking at some grandpa T-shirts.